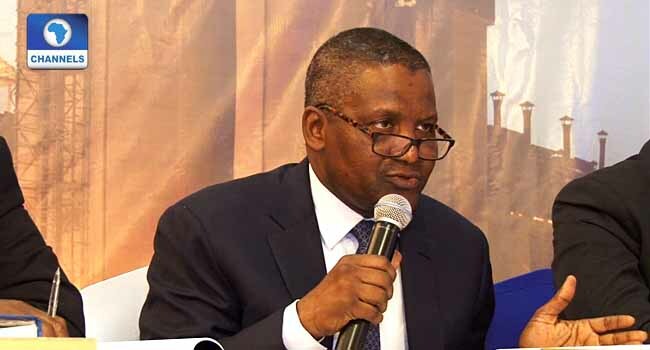 Chairman of the Dangote Group, Aliko Dangote, has applauded the Federal Government for signing an executive order which now enables private companies to build roads in the country. Mr Aliko who was a guest lecturer at the National Defense College in Abuja on Monday noted that logistics issues resulting from poor road infrastructure are a major difficulty that companies in Nigeria are grappling with. According to him, the newly signed executive order will make it possible for private companies to build roads in order to ease the transportation of goods and services from the production point to the market. President Muhammadu Buhari on Friday signed the Executive Order 007 allowing private companies to build roads which the government says it will pay back through tax relief. The President admitted that the initiative had become imperative because funding infrastructure had become a burden which the government alone could no longer bear. Read the President’s full statement below. 1. It is my pleasure to welcome you to witness this Ceremony of signing into law of the Executive Order #7 of 2019 on the Road Infrastructure Development and Refurbishment Investment Tax Credit Scheme. 2. This is another opportunity to demonstrate the commitment of this Administration to conceive, design, develop and deliver Public Private Partnerships with notable investors so as to close the road infrastructure gap in the transportation sector. 3. Since I oversaw the successful implementation of the Petroleum Trust Fund roads development programme in the 1990s, various models have been adopted in addressing this infrastructure gap. In recent years, our reliance on annual budgetary allocations to fund roads development has been disappointing, given that our budget proposals have not always been passed in an expeditious manner by the National Assembly. 4. There have also been revenue shortfalls that have hampered our efforts to fully fund critical projects. Furthermore, at the inception of this Administration, we met a significant backlog of local contractors’ debts, which we, as a responsible Administration, have undertaken to clear. 5. We did so with a view to improving the confidence of construction firms in the Federal Government, and to confirm our ability to honour financial commitments for infrastructure projects, as and when due. 6. Despite these challenges, this Administration remains committed to keeping our promises to deliver qualitative roads and transportation infrastructure to our citizens, communities and businesses. In this regard, we have consistently adopted innovative solutions to complement the annual budgetary spending on infrastructure. 7. You may recall that on 25th February 2018, I approved the establishment of a Presidential Infrastructure Development Fund, through which the Nigeria Sovereign Investment Authority is investing in critical Roads and Power Projects nationwide such as the 2nd Niger Bridge, Lagos to Ibadan Expressway, East-West Road, Abuja – Kano Road, and the Mambila Hydroelectric Power Project. 8. To date, N71 billion (Seventy-One Billion Naira) of funding of this N2.5 trillion (Two-point-Five Trillion Naira) initiative, has come from the Nigeria Sovereign Investment Authority, the Nigeria Liquefied Natural Gas Dividend Account, the Federal Budget, as well as counterpart funds from China Exim, China Development Banks, and other development partners. 9. The N100bn (One Hundred Billion Naira) raised by the Debt Management Office through the Sukuk issuance in September 2017 has been fully deployed by the Ministry of Power, Works and Housing for 25 critical economic road projects located across each of the six Geo-political Zones. 10. Furthermore, in December 2018 we raised an additional N100bn (One Hundred Billion Naira) for funding of another set of 28 road projects also spread across the six Geo-Political Zones. Through these innovative funding mechanisms, we have been able to address the challenges of project funding, cost variation and completion risks that have plagued the development of the nation’s critical roads infrastructure assets. 11. Today’s event marks another milestone in changing the narrative that has dogged past efforts at developing critical roads infrastructure nationwide. Pursuant to the Road Infrastructure Development and Refurbishment Investment Tax Credit Scheme, 19 Eligible Road Projects are to be undertaken by 6 leading manufacturing and construction firms, located in 11 States, and in each of the six Geo-political Zones. 12. Through this Scheme, companies that are willing and able to spend their own funds on constructing roads to their factories or farms, will recover their construction costs by paying reduced taxes, over a period of time. We shall ensure complete transparency in these set-offs. 13. I call on other local and international investors, as well as the State Governments, to embrace this roads infrastructure development Scheme. I personally invite you to submit viable proposals for more road projects, such that, in time, the scope of this initiative will cover all 36 States of the Federation. 14. I note the prudent fiscal risk management measures which the Minister of Finance has adopted to protect the integrity of this programme. The Minister has submitted to me, a Fiscal Implications Report that indicates how the programme’s tax credits are to be administered in a manner that does not impair our revenue projections. 15. The Minister has also laid out a set of revenue enhancement and other fiscal measures, which are targeted to increase revenues over the medium-term horizon pursuant to the Strategic Revenue Growth Initiatives programme, which she launched here in Abuja, on Wednesday, 23rd January 2019. 16. I have charged the Minister of Finance to ensure that the Management Committee, which is saddled with the responsibility of implementing this roads infrastructure development Scheme, is promptly inaugurated, so as to enable the swift and smooth take-off of this landmark initiative. 17. I trust that the members of the Management Committee, under the leadership of the Minister of Finance, as well as the Minister of Power, Works and Housing, will discharge their duties in a diligent, responsible and patriotic way. 18. In closing, I wish to express my gratitude to the participating Investors for their commitment to working with this Administration to develop and deliver critical roads infrastructure, in key economic hubs and industrial centers. I also thank the 11 State Governors, and their States, for their willingness to participate in the Pilot Phase of this programme. 19. I also thank Nigerians for the confidence reposed in this Administration’s strategy, under the Economic Recovery and Growth Plan, to ensure sustainable, inclusive and diversified growth, as well as to guarantee the socio-economic development of the nation. 20. We trust that as we shortly go to the polls, the Nigerian people will revalidate our mandate to continue to deliver on economic prosperity, national security and good governance, devoid of the bane of corruption. 21. I thank you most sincerely for your attention. 22. God bless the Federal Republic of Nigeria.